It's time to leave AZ and head east. I've got my schedule worked out planning backwards from my arrival at my aunt's outside of Chicago on 4/6. 4/6 am - Drive from eastern MO to northern IL - about 5.5 hours. 4/4 all day - Visit / Help future vandweller with a design for space and 12 volt needs. 4/2 all day drive to NM / TX border. 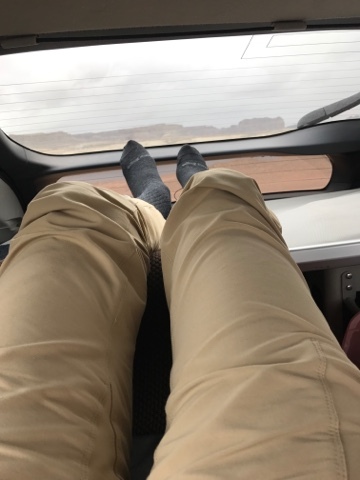 So, here I sit in my Prius (picture above) in Winslow, AZ on I40 on 4/1 planning my trip back east for my last month of travels. In the morning I will be on my way feeling sad to leave the beautiful southwest, but knowing I will pick up where I left off next year. I'm grateful for what I've gotten to do and see this year and to Joanne for partnering up to share resources and combine efforts to make it all work out. So, tomorrow (4/2) I'm off to meet a new vandweller in OKC and then on to my yearly visit to my aunt before heading southeast to see a cousin, friends and attend the SE GTG. After that a week with my east coast son and family in MD before heading home. Each of my 4 years I've traveled I come to the same point in time to start heading home. Luckily in driving behind the front that just came through here, staying away from any bad weather. I will have adventures over the remaining month and will be sharing them here on my blog.